The perfect end for the day: Everything your heart desires. Your premium dinner in Sölden. Top-quality indulgence, rustic feasting, delicacies for all senses - at your Chalet Resort Sölden you will find your personal favorite spot in culinary heaven. Even though your chalet is a holiday home, where cooking together is a lot of fun - sometimes it may also be nice not having to care about anything and to simply get pampered. Ideally, you book your dinner highlights in advance with our Chalet Package for three or five days. they are completely straightforward and individually composed for you. Grand Gourmet: Your 3-,5- or 7-course dinner at the chef's table with sommelier guidance - a highlight for all senses. Say cheese! The original cheese fondue prepared according to the chef's secret recipe - cozy, convivial, con gusto. Evening snack: A delicious selection of local specialities - cold delicacies served directly in your home. 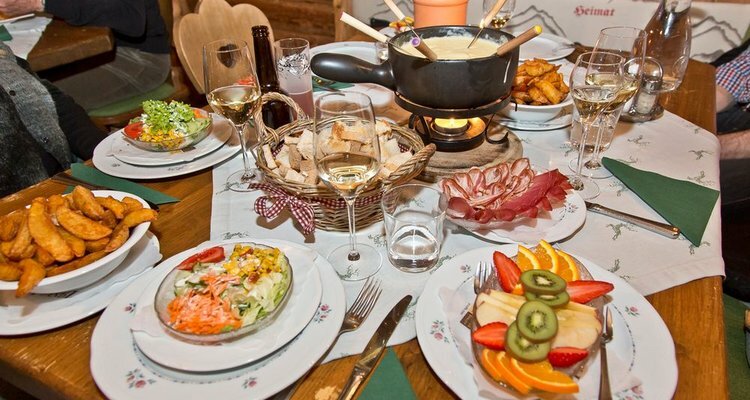 Ötzi's delight: Tyrolean culinary delights of the hearty-traditional kind for a small group in a rustic atmosphere. Based on recipes making hungry mouths happy for generations.